The NASCAR Nationwide Series and even the Camping World Truck Series are the breeding grounds for those will carry the sport into its future. It’s a series full of fresh faces many are eager to embrace and root for — and Ross Chastain fits the role perfectly, in my opinion. The 21-year-old Chastain burst onto the NASCAR scene last year in the Truck Series where it didn’t take long, nor much, to have everyone talking. This year he’s trying to keep the conversation going, keep his name where it’s supposed to be and, in turn, keep himself in the driver’s seat. There is no permanent place for him this year; as he is the latest victim of what he calls a money driven sport. In 2013, under the guidance of Brad Keselowski Racing, Chastain made his previous 22 Truck Series starts insignificant, nabbing seven top 10s and one pole while leading 229 laps. In that narrative, however, what Chastain didn’t do carried more weight and forever engrossed him with many. Two runner-up efforts at Iowa Speedway and Phoenix Raceway could have/should have been wins, and Chastain wasn’t the only one left disappointed. Since then the system has failed him, as well as those who believe the so-called NASCAR feeder system works. Not for the good guys it seems, and as it always works out, Ross Chastain is a good guy. Part of the equation is its hard to not want to see him on track. Polite in every sense of the word, and thoughtful in more than his answers and those who are asking them, he has it all. He has the good looks to be a superstar and face of a franchise, while those who have spent any amount of time with him will tell you his head is in the right place and his heart is set on racing, performing and doing right by those who matter. At Charlotte Motor Speedway last month Chastain was the driver carrying watermelons into the Nationwide Series garage, an example of some who has naturally connected with his sponsors, and Chastain has found partners who are ready to support him whenever and wherever he goes. The same goes for those in the stands, who cannot deny that after becoming familiar with the Florida native last season, he is not only easily likeable but also relatable. That’s a characteristic that sometimes gets lost in a world of big business and corporate awareness. The staleness and non-personable aurora has bitten drivers in the past and turned off supporters and even media. In Chastain’s case, it’s one of the things he has going for him, and why there are those interested in what he’s doing, when he’ll be racing and where. 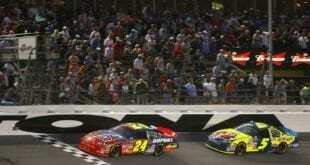 Charlotte was his Nationwide Series debut and he took the underfunded Viva Motorsports team to an 18th-place finish. Last weekend at Michigan International Speedway, Chastain again showed he is not another one-hit wonder — he is worthy of a team owner taking a chance on him. In another underfunded car, and one that most NASCAR fans — maybe even some individuals in the garage or media center — probably had never even heard of or realized was there, Chastain carried it to a 12th-place effort. He delivered the company its career best finish in the series. All weekend at the two-mile oval the No. 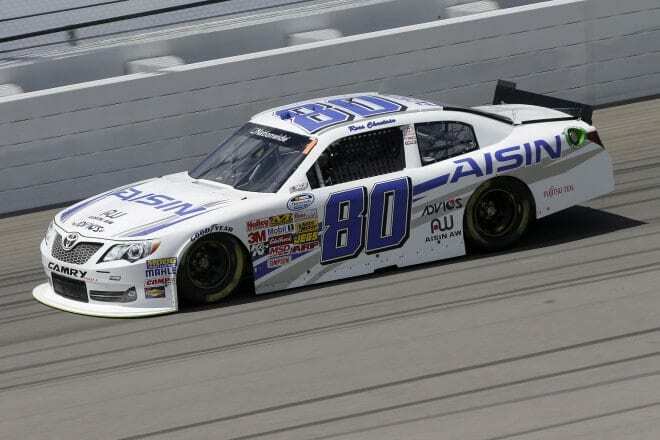 80 Shigeaki Hattori Enterprises machine with Chastain never left the top 20 in practice or qualifying, his only slip being a quick tap of the wall and spin during practice. But when it mattered most he was out of trouble and charged through the field on the final run from 20th to his credited top-15 finish. The effort from both Chastain and the team, which according to its Facebook page only has 12 employees, was a true test of talent — not that it has ever been doubted, though I would find many to be lying if they were to say that a better impression isn’t made when a driver blows through expectations with the little he is given to do so. Right now there is no indication that Chastain won’t continue to do just that as the season goes on and the next seat is presented to him. While life and racing often isn’t fair to some drivers, especially those who deserve a chance and never get it, Ross Chastain’s career is far too young to know what that feels like. And yet here he is, already fighting to for a chance to stay where he deserves. He is the future and one NASCAR needs. Kelly is our Frontstretch Nationwide Series expert, hired in 2014 to handle Friday’s Nuts For Nationwide column as well as pre- and post-race analysis of NASCAR’s second-tier division. A former SpeedwayMedia.com reporter, she shares her FS duties with work at Popular Speed as an editor and feature contributor. Based in New Jersey, Kelly hopes to move down south in the near future while furthering her racing career.